I love cards. Giving them and receiving them. If it's your birthday, I spend a lot of time picking out the perfect card for you. Often, I will buy cards when I find a perfect one, and save it until the occasion to send it arises. Recently, I was digging through those saved cards and found a blank Father's Day card. Instantly, I had an uncontrollable crying fit. This was the second Father’s Day since my dad died in March of 2012 of lung cancer. The first, I was just returning from a trip to France and Spain. It had only been three months since he was gone, but that entire time is a blur. That’s the thing about grief. It’s covered in layers that continue to unravel as time passes. 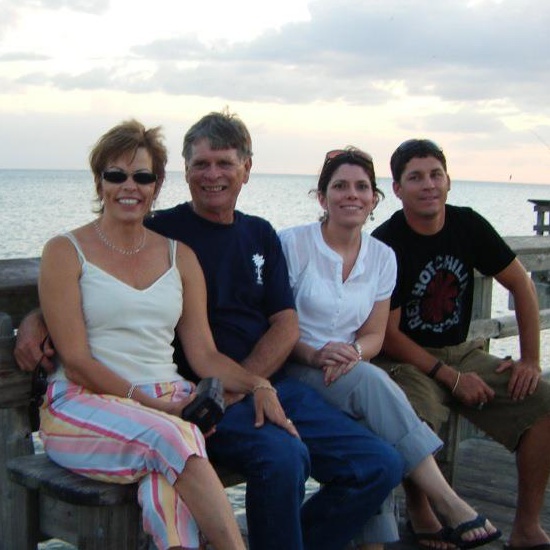 On a pier in Florida a few years ago with my father, brother, and stepmother. This year, instead of still feeling the shock of his death, I just miss my Dad. This is ironic considering our relationship was strained for years. I spent much of my life being afraid of him. Spending my childhood tiptoeing so as not to wake the beast. Time and a LOT of therapy equipped me with the tools to mend our relationship. The last few years of his life, we were as good as we would ever be. Since I couldn’t send my father that card this year, I’ll write it here. This is what I’d want him to know. I miss you. I miss discussing the random books and vitamins you would send me. I miss calling you about car questions. My battery died a couple of weeks ago and I felt a little lost at first because I couldn’t call you even though I knew what to do. When I think of you, I think of your hands. Did you know that is one of the first things I notice about someone? You had great hands. They were strong but soft. I hope the father of my children has strong yet gentle hands. I want my own children to feel the freedom of being lifted on his shoulders to see the world differently, like I did. Most of all, I miss the way you look at me. You saw my strength and determination, even when I did not. I know you not only loved me, but believed in me.